"I am going to turn this planet and everyone on it into dust!" The above info came from Matt Wilkerson, and was edited by yours truly (contact me). The image came from DragonBallWorld.it. Cooler is Frieza's older brother. Although he shares a lot in common with Frieza, he loathes him deeply. When Frieza is killed by Goku, Cooler is angry for he believes that since Frieza was killed by a saiyan, their family's honor has been soiled. He goes to Earth in order to kill Goku and restore his family's good name. However, Goku winds up blasting him toward the sun and supposedly killing him. However, he was not gone. When a sentient computer chip began to draw metal parts around itself to create the Big Gete Star, it also drew in Cooler's conscience. Because of this, Cooler's mind dominated the Big Gete Star's main computer and in a sense became the Big Gete Star, where he then created a metal body to use against Goku, and then later dozens of Metal Coolers to use against Goku and Vegeta. When the two Super Saiyans were defeated by the army of Coolers, Cooler (BGS) began to siphon the energy out of both of them. He stops eventually, marveling over how much energy the two of them possess and says that if he had drawn any more, he would overload his circuit. Goku and Vegeta both hear this and starts forcing even more energy into the Big Gete Star, eventually incapacitating it. They saved Piccolo, Krillin, Gohan, Oolong, Yajirobe, and the Namekians this way, for the rest of the Metal Coolers were destroyed. Cooler made one last attempt to kill Goku, but Vegeta frees Goku, who prepared a ki blast that wiped out the Big Gete Star, along with Cooler. 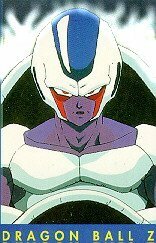 Cooler makes a very brief appearance in Dragon Ball GT, when the enemies of the Z-Fighters escape from Hell/HFIL during the Super Android 17 Saga, as you see him in his final fourth form flying towards the city. It is not seen if he is sent back to Hell/HFIL, but he probably was. Editor's Note: I've been told by someone that the name of Cooler's race is "changeling", but I have yet to find any official evidence to support this claim.